For the meritorious periods of Ekadasi, the following are considered as necessary activities to be undertaken by all for great benefits – Complete abstinence from food and dedication of time listening to the glories of The Lord (Sravanam). It is definitely not advisable to consume grains on Ekadasi days as it is considered a sin. Upavaasa : Upa - near the self ; Vaasa – Being; Thus Upavaasam in Sanskrit means being near the self. Fasting procedures are existent for use by people who are not able to perform sacrificial ceremonies and corresponding spiritual procedures, especially in the current age. In order to attain a peaceful state in this world and other higher planes, fasting procedure undertaken with certain laid out rules and procedures are said to help with the means. Observing fasting with the real spiritual sense helps with cleansing of our bodies and minds. There are no greater tapas than undertaking periodic fasting and upavasam. If it’s very difficult, water, milk and fruits can be consumed as needed – this does not constitute as a violation to the rules of ekadasi fasting. Once there was a king called Rukmangadan, who established Hari Bhakthi (devotion of Lord Vishnu) in his kingdom and ruled wisely and well. He had a good-natured wife named Chandravali and a son called Dharmaangatan. One day Sage Narada visited the king’s palace. Having received and treated the sage in a proper and pious manner, the king asked the sage thus, ‘which is the greatest Dharma?’. Sage Narada replied to the king that observing Ekadasi fasting is the greatest dharma. From then, King Rukmangadan observed every Ekadasi fasting regularly and also encouraged people of his kingdom to observe and follow Ekadasi, which they did. The kingdom grew in prosperity. The people lived peacefully, with longevity and good health. Lord Brahma came to know about King Rukmangadan and wanted to test the king’s steadfastness of following Ekadasi fasting. Lord Brahma created a beautiful and attractive young lady called Mohini and assigned her the task to test the king. Mohini met king Rukmangadan in a forest while he was about hunting there. The king fell for her beauty and asked about her background. She replied, “ I was created by Lord Brahma himself, my name is Mohini”. The king proposed to marry her. Mohini agreed to marry the king only on the condition that he will always agree and oblige with whatever she requests and asks for. King Rukmangadan married Mohini and set about to the country from the forest. 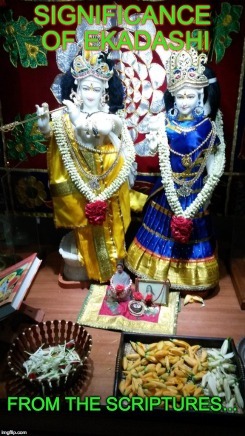 Queen Chandravali and prince Dharmaangatan continued about following Ekadasi fasting and associated procedures ever so sincerely as before and also ensured to remind the king whenever needed, so the king also continued his pious activities. When it was time for another Ekadasi, the kingdom’s public informers set about announcing the arrival of Ekadasi (on the previous day, the day of Dasami). While the king urged Mohini to undertake the fasting and procedures, Mohini refused and also asked the king not to undertake the fasting. She reasoned, “It is sufficient that you have followed Ekadasi fasting for so long and accrued so much good merits (punya). Moreover the people of this kingdom are also observing so piously, so the kingdom will also continue to prosper. So you need not follow Ekadasi fasting and procedures this time”. King Rukmangadan denied this flatly, and said, “A king should follow Dharma and should be an example for his subjects on such matters. Since you are my wife, you should also follow what I do on the Dharmic path”. Mohini replied, “ I am not interested in accruing such merits. All I care for is my pleasure and carefree living. Hence you should ensure this by staying with me without observing the Ekadasi fasting’. For this the king responded, “I may leave queen Chandravali, prince Dharmaangatan, and even you, but never will I leave the observance of Ekadasi fasting and procedures” and prepared to leave her. Mohini reminded the king of his promise of fulfilling all her desires and that he was not honoring the promise now. Angry that he did not oblige to forsake Ekadasi fasting for her sake, she demanded that prince Dharmaangatan be slayed, as a compromise. The king denied this too and quite harshly told her to leave the kingdom. But Mohini continued to deplore that, “Since you are breaking your promise, the people of your kingdom will not trust and follow you in any matters. When you die you will not even gain an entry into hell let alone the heaven”. The bewildered king then fell at her feet asking her to make an excuse and save him from the situation of breaking a promise. When queen Chadravali came to know about this, she took her son to the king and assuaged, “ Oh King! I know very well about you. You don’t have to quit Ekadasi for the sake of your promise. You can satisfy the other condition by beheading your son (the prince)”. The prince also vowed that he was ready to lay his life for the sake of his father and Ekadasi and bent down to his father. Even this display of righteousness and Dharma from the queen and prince as well as the king’s sorrow did not deter Mohini and she insisted that the prince be beheaded in order for the king to satisfy his promise to her. The grief stricken king took a fresh vow not to touch Mohini again and took his sword and addressed the prince, “ Hey Dharmaangatan! Meditate upon Lord Sriman Narayana. When you hold onto His image at the time of death, you can attain Him!”. When the sword was thrown towards the prince by his father, it transformed into a flower garland and fell on the prince. At that very moment, Lord Vishnu appeared there in His full majestic form, in front of everyone. All of the prayed to The Lord and then The Lord asked Rukmangadan to request for a boon. Rukmangadan requested that he be bestowed with Hari Bhakti in his life after life. Sri Vishnu granted the king’s wish and disappeared. Left alone by the king, Mohini sought Lord Brahma and asked what was to become of her and how she will survive. Lord Brahma blessed her that she will gain merits and strength from those people who observe Ekadasi fasting wrongly, especially in the wrong overlapping time periods of Dasami and Ekadasi. Thus the greatness of Ekadasi fasting is being told and established.